In economics, an indifference curve connects points on a graph representing different quantities of two goods, points between which a consumer is indifferent. That is, the consumer has no preference for one combination or bundle of goods over a different combination on the same curve. One can also refer to each point on the indifference curve as rendering the same level of utility (satisfaction) for the consumer. In other words, an indifference curve is the locus of various points showing different combinations of two goods providing equal utility to the consumer. Utility is then a device to represent preferences rather than something from which preferences come. The main use of indifference curves is in the representation of potentially observable demand patterns for individual consumers over commodity bundles. There are infinitely many indifference curves: one passes through each combination. A collection of (selected) indifference curves, illustrated graphically, is referred to as an indifference map. The theory of indifference curves was developed by Francis Ysidro Edgeworth, who explained in his 1881 book the mathematics needed for their drawing; later on, Vilfredo Pareto was the first author to actually draw these curves, in his 1906 book. The theory can be derived from William Stanley Jevons' ordinal utility theory, which posits that individuals can always rank any consumption bundles by order of preference. A graph of indifference curves for several utility levels of an individual consumer is called an indifference map. Points yielding different utility levels are each associated with distinct indifference curves and these indifference curves on the indifference map are like contour lines on a topographical graph. Each point on the curve represents the same elevation. If you move "off" an indifference curve traveling in a northeast direction (assuming positive marginal utility for the goods) you are essentially climbing a mound of utility. The higher you go the greater the level of utility. The non-satiation requirement means that you will never reach the "top," or a "bliss point," a consumption bundle that is preferred to all others. Defined only in the non-negative quadrant of commodity quantities (i.e. the possibility of having negative quantities of any good is ignored). Complete, such that all points on an indifference curve are ranked equally preferred and ranked either more or less preferred than every other point not on the curve. So, with (2), no two curves can intersect (otherwise non-satiation would be violated). Transitive with respect to points on distinct indifference curves. That is, if each point on I2 is (strictly) preferred to each point on I1, and each point on I3 is preferred to each point on I2, each point on I3 is preferred to each point on I1. A negative slope and transitivity exclude indifference curves crossing, since straight lines from the origin on both sides of where they crossed would give opposite and intransitive preference rankings. (Strictly) convex. With (2), convex preferences[clarification needed] imply that the indifference curves cannot be concave to the origin, i.e. they will either be straight lines or bulge toward the origin of the indifference curve. If the latter is the case, then as a consumer decreases consumption of one good in successive units, successively larger doses of the other good are required to keep satisfaction unchanged. Preferences are complete. The consumer has ranked all available alternative combinations of commodities in terms of the satisfaction they provide him. This axiom precludes the possibility that the consumer cannot decide, It assumes that a consumer is able to make this comparison with respect to every conceivable bundle of goods. If A p B and B p C, then A p C.
Also if A I B and B I C, then A I C.
This is a consistency assumption. If A is preferred to B and C is sufficiently close to B then A is preferred to C.
A p B and C → B ⇒ A p C.
"Continuous" means infinitely divisible - just like there are infinitely many numbers between 1 and 2 all bundles are infinitely divisible. This assumption makes indifference curves continuous. If A has more of both x and y than B, then A is preferred to B. This assumption is commonly called the "more is better" assumption. An alternative version of this assumption requires that if A and B have the same quantity of one good, but A has more of the other, then A is preferred to B. It also implies that the commodities are good rather than bad. Examples of bad commodities can be disease, pollution etc. because we always desire less of such things. This assumption assures that indifference curves are smooth and convex to the origin. This assumption also set the stage for using techniques of constrained optimization because the shape of the curve assures that the first derivative is negative and the second is positive. Another name for this assumption is the substitution assumption. It is the most critical assumption of consumer theory: Consumers are willing to give up or trade-off some of one good to get more of another. The fundamental assertion is that there is a maximum amount that "a consumer will give up, of one commodity, to get one unit of another good, in that amount which will leave the consumer indifferent between the new and old situations" The negative slope of the indifference curves represents the willingness of the consumer to make a trade off. To maximise utility, a household should consume at (Qx, Qy). Assuming it does, a full demand schedule can be deduced as the price of one good fluctuates. Consumer theory uses indifference curves and budget constraints to generate consumer demand curves. For a single consumer, this is a relatively simple process. First, let one good be an example market e.g., carrots, and let the other be a composite of all other goods. Budget constraints give a straight line on the indifference map showing all the possible distributions between the two goods; the point of maximum utility is then the point at which an indifference curve is tangent to the budget line (illustrated). This follows from common sense: if the market values a good more than the household, the household will sell it; if the market values a good less than the household, the household will buy it. The process then continues until the market's and household's marginal rates of substitution are equal. Now, if the price of carrots were to change, and the price of all other goods were to remain constant, the gradient of the budget line would also change, leading to a different point of tangency and a different quantity demanded. These price / quantity combinations can then be used to deduce a full demand curve. A line connecting all points of tangency between the indifference curve and the budget constraint is called the expansion path. Figure 2: Three indifference curves where Goods X and Y are perfect substitutes. The gray line perpendicular to all curves indicates the curves are mutually parallel. Figure 3: Indifference curves for perfect complements X and Y. The elbows of the curves are collinear.
. The negative slope of the indifference curve incorporates the willingness of the consumer to make trade offs. in Fig. 1 would reduce quantity demanded of a good smoothly as price rose relatively for that good. in Fig. 2 would have either no effect on quantity demanded of either good (at one end of the budget constraint) or would change quantity demanded from one end of the budget constraint to the other. Choice theory formally represents consumers by a preference relation, and use this representation to derive indifference curves showing combinations of equal preference to the consumer. be a set of mutually exclusive alternatives among which a consumer can choose. is another combination such as 2 apples and 2 bananas. , meaning not that they are unwanted but that they are equally good in satisfying preferences. : the indifference curves are straight lines. These examples might be useful for modelling individual or aggregate demand. As used in biology, the indifference curve is a model for how animals 'decide' whether to perform a particular behavior, based on changes in two variables which can increase in intensity, one along the x-axis and the other along the y-axis. For example, the x-axis may measure the quantity of food available while the y-axis measures the risk involved in obtaining it. The indifference curve is drawn to predict the animal's behavior at various levels of risk and food availability. Indifference curves inherit the criticisms directed at utility more generally. Herbert Hovenkamp (1991) has argued that the presence of an endowment effect has significant implications for law and economics, particularly in regard to welfare economics. He argues that the presence of an endowment effect indicates that a person has no indifference curve (see however Hanemann, 1991) rendering the neoclassical tools of welfare analysis useless, concluding that courts should instead use WTA as a measure of value. Fischel (1995) however, raises the counterpoint that using WTA as a measure of value would deter the development of a nation's infrastructure and economic growth. ^ The transitivity of weak preferences is sufficient for most indifference-curve analyses: If A is weakly preferred to B, meaning that the consumer likes A at least as much as B, and B is weakly preferred to C, then A is weakly preferred to C.
^ Indifference curves can be used to derive the individual demand curve. However, the assumptions of consumer preference theory do not guarantee that the demand curve will have a negative slope. ^ Geanakoplos, John (1987). "Arrow-Debreu model of general equilibrium". The New Palgrave: A Dictionary of Economics. 1. pp. 116–124 [p. 117]. ^ Böhm, Volker; Haller, Hans (1987). "Demand theory". The New Palgrave: A Dictionary of Economics. 1. pp. 785–792 [p. 785]. ^ Francis Ysidro Edgeworth (1881). Mathematical Psychics: An Essay on the Application of Mathematics to the Moral Sciences. London: C. Kegan Paul and Co.
^ Vilfredo Pareto (1919). Manuale di Economia Politica — con una Introduzione alla Scienza Sociale [Manual of Political Economy]. Piccola Biblioteca Scientifica. 13. Milano: Societa Editrice Libraria. ^ "Indifference curves | Policonomics". Retrieved 2018-12-08. ^ "William Stanley Jevons - Policonomics". www.policonomics.com. Retrieved 23 March 2018. ^ a b c d e f g Binger; Hoffman (1998). Microeconomics with Calculus (2nd ed.). Reading: Addison-Wesley. pp. 109–117. ISBN 0-321-01225-9. ^ a b Perloff, Jeffrey M. (2008). Microeconomics: Theory & Applications with Calculus. Boston: Addison-Wesley. p. 62. ISBN 978-0-321-27794-7. ^ a b c Silberberg; Suen (2000). The Structure of Economics: A Mathematical Analysis (3rd ed.). Boston: McGraw-Hill. ISBN 0-07-118136-9. ^ a b Lipsey, Richard G. (1975). An Introduction to Positive Economics (Fourth ed.). Weidenfeld & Nicolson. pp. 182–186. ISBN 0-297-76899-9. ^ Salvatore, Dominick (1989). Schaum's Outline of Theory and Problems of Managerial Economics. McGraw-Hill. ISBN 0-07-054513-8. ^ Binger; Hoffman (1998). Microeconomics with Calculus (2nd ed.). Reading: Addison-Wesley. pp. 141–143. ISBN 0-321-01225-9. ^ Hovenkamp, Herbert (1991). "Legal Policy and the Endowment Effect". The Journal of Legal Studies. 20 (2): 225. doi:10.1086/467886. ^ Hanemann, W. Michael (1991). "Willingness To Pay and Willingness To Accept: How Much Can They Differ? Reply". American Economic Review. 81 (3): 635–647. doi:10.1257/000282803321455449. JSTOR 2006525. ^ Fischel, William A. (1995). "The offer/ask disparity and just compensation for takings: A constitutional choice perspective". International Review of Law and Economics. 15 (2): 187–203. doi:10.1016/0144-8188(94)00005-F.
Beattie, Bruce R.; LaFrance, Jeffrey T. (2006). "The Law of Demand versus Diminishing Marginal Utility" (PDF). Appl. Econ. Perspect. Pol. 28 (2): 263–271. doi:10.1111/j.1467-9353.2006.00286.x. 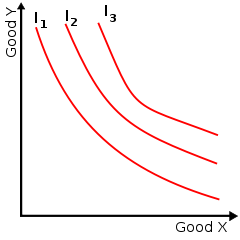 Wikimedia Commons has media related to Indifference curves.